October 2nd reminds us of the birthday of two of our national leaders, Mohandas Karamchand Gandhi and Lal Bahudar Shastri. Both these leaders played a significant role in India’s Independence movement. Their struggle and hardships gave India her independence while the principles, values and learning from them are nothing less than an environmental awareness lesson on sustainable development. By means of non-violence, civil disobedience and Satyagraha, Mahatma Gandhi set India free and inspired civil movements for freedom across the world. Addressed as Bapu ,“the father of the nation”, his birthday is commemorated as Gandhi Jayanti and also International Day of Non-Violence across the world. 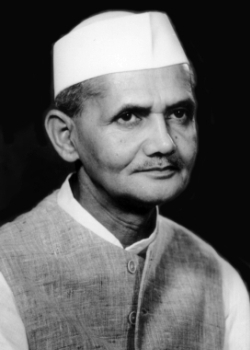 Lal Bahadur Shastri, the second prime minister of free India, mobilized national support during the 1965 war and coined the slogan “Jai Jawan, Jai Kisan” empowering both the farmers and the soldiers of the country. Gandhi’s lifestyle is an example of what we call in today’s world “Green Living”. He was the man of simplicity. He advocated the wearing of khadi and made sure his followers did the same. He promoted the concept of charkha for the weaving of clothes, an ultimate symbol of self sufficiency. 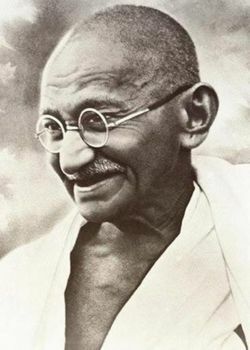 The practice of giving up unnecessary expenditure, embracing a simple lifestyle and washing his own clothes, Gandhi called it “reducing himself to zero”. Gandhi believed that “Earth provides enough to satisfy every man’s need but not any man’s greed”. Addressing the issue of equity, he urged rich people to treat their wealth as a trust for the poorer ones and use it for their welfare. To Gandhi, poverty was the most severe polluter. Hence poverty must be eradicated and that can be done only when everybody is taking their own share and not grabbing others’ share. This can only be ensured by limiting people’s needs and sharing people’s resources. Gandhi asked the people to realize and differentiate between their actual needs and artificial wants and control the latter. For him, the real need meant to possess only what is absolutely necessary for the moment. To him this would not only help the unprivileged of today but would help protect the environment for the next generation as he strongly believed in his statement that “We do not inherit the Earth from our Ancestors; we borrow it from our children”. Gandhi’s life was his message. He never talked about environment as such yet he was true and real environmentalist. He practiced what he preached “Be the change that one wants to see in the world”. Giving away all the property, keeping few pair of clothes, using scraps of papers to write brief notes and reversed envelopes for reuse to send letters. He used minimum water for bathing. He is the legendary example of what we call 3R’s- Reduce, Reuse and Recycle. The best part of Gandhi’s ideas was that they empower the individual. It is up to each and every individual to simplify his or her life; to share his or her resources and to care for his and her surroundings. In today’s world, Gandhian thoughts hold the key to solving problems concerning environment degradation and climate change. Gandhi’s teaching and thoughts are particularly relevant in the present day, when the threat of climate change is looming large and natural resources are fast depleting. PrevWhat Did You Learn From Your Father Dear India?